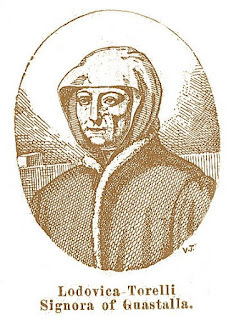 Among the many evils that afflicted the church in Zaccaria's time was the ruin caused by heresy and corruption of morals in the convents of the holy virgins. In Milan especially, there was no longer any observance nor religious spirit in the cloisters. Anthony Mary, while he applied himself with his religious to reform the people, began to think how he could manage also to found an order of nuns which would serve as a model and a means of reform to other religious as well as to their families. He was at that time spiritual director to the Countess Ludovica Torelli of Guastalla and guardian as well as director to some young girls whom he had, some time before, taken into a house (near St. Ambrose) to keep them from the dangers of the world. Under such a guide, the Countess and her young charges had made great and rapid progress in virtue. The Countess, who before had loved to lead the fashions and vanities in the world, had now such a contempt for herself and her past life that her example was a marvel to everyone. Whereas, before she never went out except in her carriage, magnificently attired, and accompanied by her numerous attendants, she was now always to be seen on foot and quite alone, going even to the Senate and visiting the most distinguished personages plainly dressed in brown clothes. Instead of the fashionable headdress then worn, she chose a large black veil. Not only this, but if by chance she met Zaccaria in the street, she was not ashamed to kneel down before him and ask his blessing and accuse herself of some defect. At other times to humble herself, and out of human respect, she would present herself in the most frequented parts of the city, wearing a torn dress and a headdress such as was worn by the poor. Now, as Anthony Mary saw that these young girls (of whom we have already spoken) were disposed, both by desire and by their virtue to embrace the religious state, he encouraged the Countess to petition the Sovereign Pontiff for permission to found a new Order of nuns. 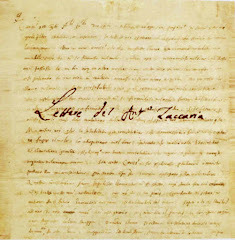 Having received this permission on January 15, 1535, he gave fervent thanks to God. He then bought some houses near the parish of St. Eufemia and had them converted to serve as a convent. There, he sent his spiritual daughters to reside. How admirable are the ways of Divine Providence! Thus was fulfilled what had been prophesied years before by the Blessed Amedeo, a Franciscan, who, passing by one day and seeing these houses, infamous dens of immorality, of gambling, and of every vice, exclaimed: "Blessed be God! A time will come when these houses, now the abode of demons, will be the chosen and holy dwellings of angels." On February 26, 1536, Anthony Mary clothed some of these virgins with the religious habit. When it came to settling as to what name the new Order should have, a young novice 16 years of age called Agnese Baldironi, after all the other religious had given their opinion, said, "I think we should be called Angelic Sisters in order that this name may continually remind us that our lives should resemble that of the angels." The proposition was received with acclamation by all the nuns. 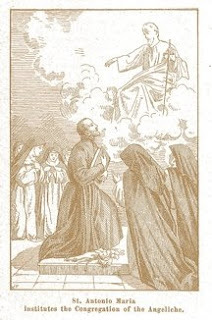 Anthony Mary approved of it and added the name of St. Paul (Angelic Sisters of St. Paul), saying that the purity of angels is only reached by struggling against the flesh and by loving the Cross. In a short time, this new order became so renowned for the virtue of its religious and the great good done by them in other convents and families in Milan, that it won the esteem of many of the bishops of Lombardy and Venice who wished to have it established in their diocese. It must be borne in mind that Anthony Mary did not place upon the Angelics the obligation of cloistering. Anthony's idea, as we have seen, was to send his spiritual daughters to work in the busy world. He wished that their virginal hearts should expand with maternal charity towards all. To reform the convents of nuns, to teach catechism to women and children, to accompany the Fathers in their missions, to assist the sick in their homes, to visit the hospitals and prisons, and do all such works of charity, such was the end for which they were instituted and in which they would probably have continued if, later on, the Council of Trent had not imposed cloistering on all nuns. 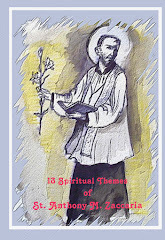 From such a vigorous apostolate, there could only come forth the most abundant fruits. The Angelics had, as a matter of fact, three magnificent convents, St. Paul's in Milan, St. Martha's in Cremona and St. Paul's in Monza. These convents to which were annexed boarding schools enclosed the flower of the nobility of Lombardy. They were afterwards suppressed with violence by Napoleon I. Now, by God's grace, the Angelics have been re-established by Father Pio Mauri, a Barnabite and have a spacious convent outside the Porta Magenta in Milan. Now that their Founder has risen more glorious than ever, the Angelics, too, have risen, full of life and vigor. 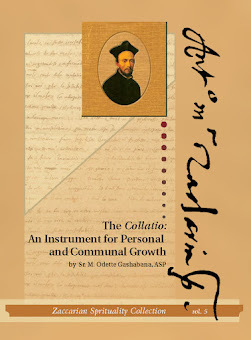 Happily, the saint may have thus recalled them to rejoin his sons with a view to a new apostolate, vigorous as the first, to do good work in society, which is now, in many respects, even worse than it was in the 16th Century. God grant that such may be His design. Fiat! Fiat! (Latin) Let it be done! Let it be done!